Folk Saint. War hero. Outlaw deserter. Dubious myth. Antonio Mamerto Gil Núñez, better known as ‘Gauchito Gil’ is the colorful figure revered as a mystical symbol of bravery in his native Argentina. Gauchito Gil is usually depicted as a mustached Christ-like figure dressed in red. Imagine Robin Hood meets patriotic soldier meets protective Saint and you will have some idea of the many sentiments this mercurial character elicits in Argentine popular culture. According to the story, Gauchito Gil lived, loved and fought in provincial Argentina back in the nineteenth century before he was strung up and executed for desertion on January, 8, 1878. It’s an adventure story sprinkled with pagan mysticism, but it remains unclear how much of it is fact, and how much is fable. What cannot be questioned is the extent to which he is revered by many Argentines, despite being in no way sanctioned by the Catholic Church. Corrientes is a steamy, subtropical frontier province which lies between the Pampas and the borders of Paraguay, Brazil and Uruguay in Argentina’s far north-east. Historically its capital of the same name served as a stop-over town between Buenos Aires and Asunción for purveyors of both commerce and spirituality. It was a land of Jesuit missions and powerful caudillos, the political strongmen who ruled over the population like feudal kings. In the 1860s, Corrientes was in political turmoil, suffering the effects of South America’s bloodiest ever conflict, The Paraguayan War, and the fall of the great caudillo, Juan Manuel de Rosas. It is from these heady times that the Gauchito Gil legend emerges. Estrella Díaz de Miraflores, so the story goes, was a widow and wealthy rancher from the town of Pay Ubre, who began a salacious love affair with the gaucho, Antonio Gil. For a woman of wealth and fine breeding to sully herself with a gaucho (the fierce, knife-wielding drifters who roamed the Pampas looking for ranching work) was sure to cause a stir. Indeed, it certainly riled the local police commissioner, who himself had eyes for the widow. He conspired with Doña Estrella’s brothers to frame Gil for robbery and thus expel this thorny intruder from all of their lives. No stranger to rambling, Antonio took flight before the local police could nab him. He sought refuge in the army, and went off to fight bravely for the Triple Alliance forces against the marauding Paraguayans, proving to be a patriotic and inspirational warrior. He returned to Pay Ubre a hero. These were troubled times though, and the power vacuum left by the ousted tyrant Rosas fostered the emergence of two factions, the liberal Blues and the federalist Reds. Civil War broke out and Antonio was recruited into the Blue forces. Not only was Blue ideology against all of Gil’s gaucho principles, he was sick of war altogether, let alone a war that pitted countryman against countryman, brother against brother. With a couple of companions, he fled the army. They took to banditry, living off the land by poaching livestock. They were able to evade capture with the help of local peasants, who saw Gil as an honorable thief, taking from the rich and giving to the poor, a rebel standing up to greedy and corrupt authorities. Eventually, Gil’s band was ambushed by police and his companions were gunned down. Gil was marched to Goya for trial, and it is here in the story where he evolves from Robin Hood-style popular outlaw to mystical Saint-figure. Displaying the type of wickedness that one would expect from a crooked cop in stories such as this ine, the police captain who was transporting Gauchito Gil for trial decided he couldn’t be bothered with the long journey, and ordered the prisoner executed on the spot on a phony ‘attempted escape’ charge. He was hung by his feet to a tree and a deputy prepared to slit his throat. The gaucho implored him to wait, insisting that an official pardon was already on the way. Scoffing at this desperate attempt, the officer continued with his preparations. Little did he know that the judge in Goya had indeed already pardoned Gil, but alas the message would arrive moments too late. Then the prisoner told the policeman that rather than carry out this unjust act, he should go home to care for his son, who had suddenly taken ill. The policeman was not swayed by such tactics, however, and proceeded with the execution. Just before he slit the outlaw’s throat, Gil told him that the only way he would save his son would be to invoke the name Gauchito Gil in prayer. Unmoved, the officer did the gruesome deed, ending Gil’s life, while guaranteeing his immortality. When he arrived home after burying Gil, he did find his son gravely ill. He prayed to the recently deceased gaucho, and his son was miraculously cured. The next day he returned to the burial site and planted a wooden cross, and upon hearing the story of the merciful bandit who had saved his executioner’s son from beyond the grave, others also came to visit the site, and the first Gauchito Gil shrine was born. Soon, the rich landowner on whose property Gil lay buried got sick of the constant pilgrims and had the remains removed to the cemetery in the nearby town of Mercedes. Immediately he fell seriously ill as well, and remained so until he prayed to Gil for forgiveness. 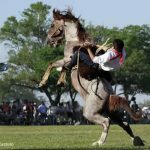 From this story, and other variations of it, emerges a pagan-style cult that manages to attract masses of devotees throughout Argentina, despite lacking any official sanction. On January 8 every year, more than 100,000 devotees flock to Pay Ubre to honor Gauchito Gil as the cross from his shrine is marched in a procession to the church in Mercedes. 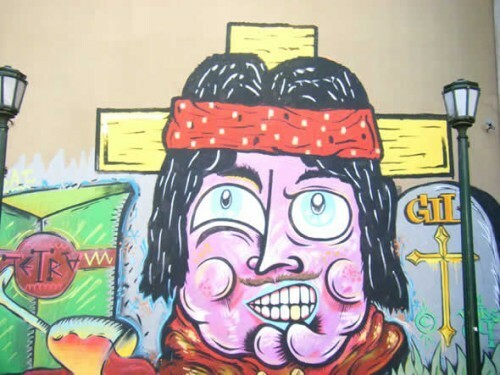 Representations are easily recognizable, and appear all over the country; the hirsute gaucho with a red poncho and red bandanna, and an always prominent wooden cross. 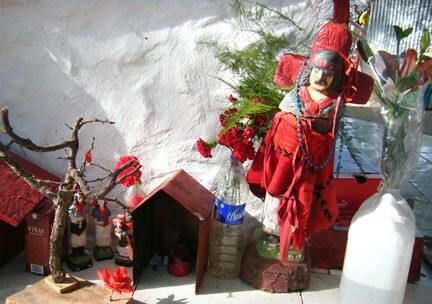 Devotion is particularly strong in the Northern provinces such as Santa Fe, Chaco and Mendoza, as well as Corrientes of course, where roadside shrines adorned with red flags, crosses and candles are a common sight. Even in the metropolis of Buenos Aires it is possible to see Gauchito Gil in all sorts of unexpected places. He appears as a figurine looking over bars and restaurants, on stickers on the back of delivery trucks offering them safe passage, and even in wall-sized graffiti tributes.